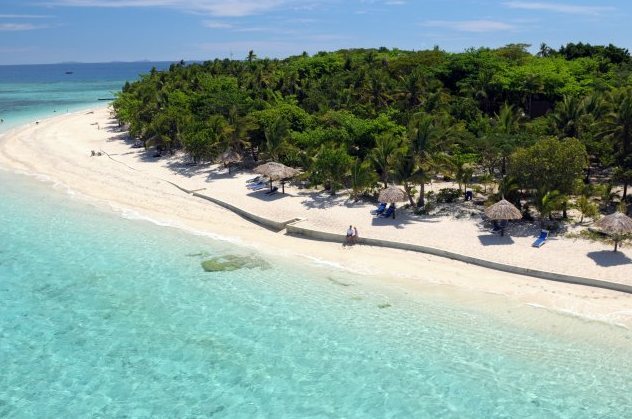 Set on a coral- and sand-fringed atoll within a stunning marine sanctuary, Treasure Island is one of Fiji's most iconic resorts, with over 36 years' experience in providing hospitality and friendship to travellers from across the globe. Photo copyright Treasure Island Resort. islands, Treasure Island Resort is set on a sand fringed coral cay and has over 36 years experience in creating unique holiday experiences. 66 Fijian styled bures are all positioned for privacy and views. Room types include: Beachfront, Oceanview and Island Bures; all are within 30 meters of the white sandy beach and feature air conditioning, private balcony with sun lounges and hammock, refrigerator, plus tea and coffee making facilities. Most are duplex style with interconnecting doors. The resort also features a stunning beachside wedding chapel and a variety of cultural activities daily. Amenities include a restaurant/bar, 3 swimming pools including 1 children's pool, games room, 9-hole putting golf course, flood lit tennis court, upgraded Senekal Spa, PADI 5 star dive centre, motorized and non-motorised water sports. Our magnificent main bure houses the Elevuka Restaurant and Takia Bar, in addition to the dance area where a live band plays every night. Casually elegant, this tropical dining room serves mouth-watering delights harvested from the South Sea on its international a la carte menu. Tempting alternatives include weekly beach banquets and barbeques, lovo feasts, buffets and the spectacle of a tableside flambe. For dinner we recommend you reserve a table of your preference with our restaurant supervisor on duty.